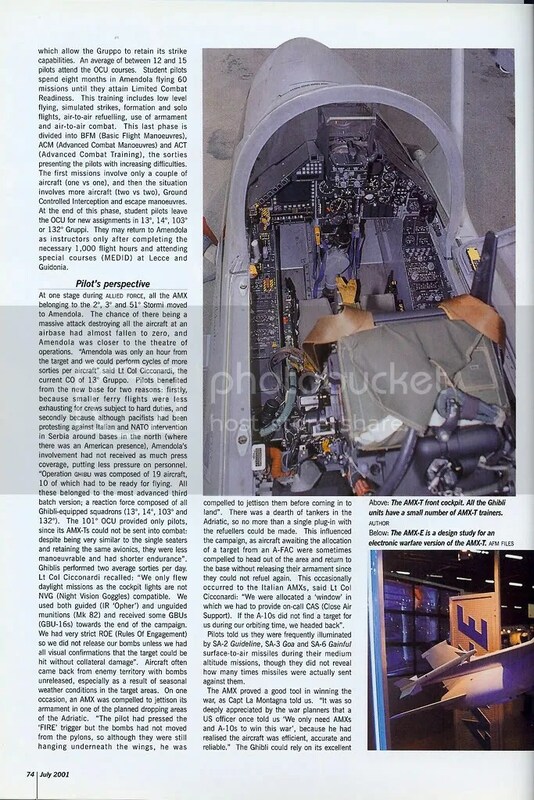 The following article was published on the July 2001 issue of Air Forces Monthly. David Cenciotti looks at the AMX, the present situation, the future upgrades and its war against Serbia. “You can’t get defence on the cheap! Too much of Europe’s defences are based on yesterday’s enemies and not tomorrow’s threats”. These are the words that NATO’s Secretary General George Robertson told European allies recently to warn them that they must spend more to obtain the same US strength in the crisis-management. Italy was surely among those nations that this warning was addressed to. The war against Serbia was the first one fought in Europe since the end of WWII. For the Aeronautica Militare Italiana, the Allied Force operation represented the most important experience in its history and, after the war ended, the debriefing and pilot experiences allowed for the writing of a series of so called “Lessons Learned”. Post-war reports were used to understand what worked well and what instead went wrong in order to prevent similar mistakes to re-occur in the future. Every future war will be fought according to the guide lines set by this war’s experiences and every operation will be similar to the Allied Force, possibly better. The intervention in the Balkans was an invaluable test bed of the actual effectiveness of the NATO power and at the same time it showed how, most of the US partners, Italy included, lacked advanced weapons systems, communications, precision guided munitions and logistics. This war’s “memories”, will allow planners to better focus on the Forces’ priorities in the future: upgrades of the fleets will be based on the results obtained by the aircraft in a war environment and purchases will be more accurate so as to fill the gap with effectiveness. This is what will happen to one of the winners of the Italian Allied Force: the “Ghibli”. The AMX fleet approached the war with a bad reputation (someone used to say: “it takes-off only because of earth’s curvature and uses fuel to produce smoke!”) but, surprisingly, it performed so well in a highly technological environment so as to be considered one of the most respectable aircraft flying in the Allied Force. Based on these good results, it will surely be upgraded soon. 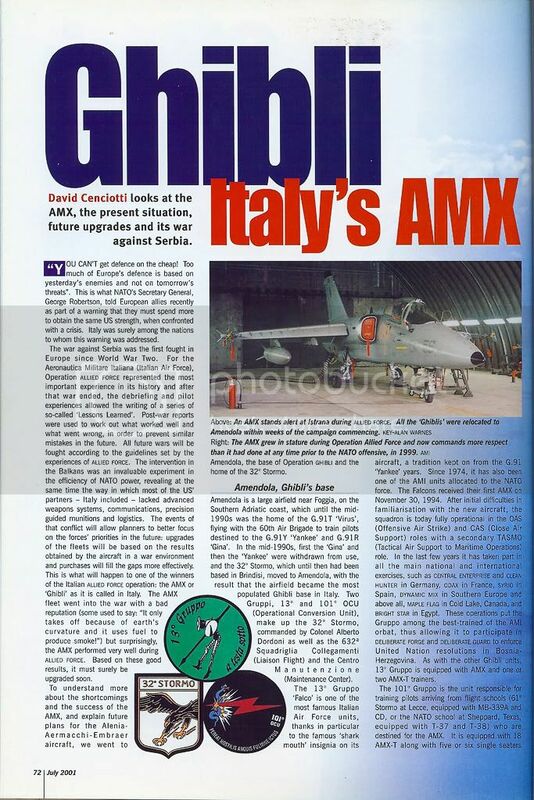 In order to understand the AMX success, its shortcomings and explain future plans of the Alenia-Aermacchi-Embraer aircraft, we went to Amendola, the base of Operation Ghibli (how the AMX intervention in Serbia was named within the Italian Air Force), and the home of the 32nd Stormo. Amendola is a large airfield located near Foggia, on the Southern Adriatic coastline. Until the mid ‘90s it was the home of the G-91T “Virus” flying with the 60th Air Brigade to train pilots destined to the G-91Y “Yankee” and G-91R “Gina”. In the mid-nineties, the “Gina” first and the “Yankee” later were withdrawn from use, the 32nd Stormo until then based in Brindisi moved to Amendola and consequently the airport became the most populated Ghibli base in Italy. Two Gruppi compose the 32nd Stormo, whose Commander is Col. Alberto Dordoni: 13th Gruppo and 101st OCU (Operational Conversion Unit). Hosted here are also the F-16s of the RNethAF and BAF DAFT detachments that still fly two sorties each per day above the Balkan area, the 632nd Squadriglia Collegamenti, liaison flight and the Centro Manutenzione, Maintenance Center. The 13th Gruppo “Falco” is one of the most famous Italian Air Force unit especially thanks to the famous “sharkmouth” appearing on its aircraft, a tradition kept from the G-91 Yankee years. Since 1974, it is also one of the AMI units allocated to the NATO force. The Falcons received their first AMX on November 30th 1994. After initial difficulties in familiarizing with the new aircraft, the squadron is today fully operational in the OAS (Offensive Air Strike) and CAS (Close Air Support) role with secondary TASMO (Tactical Air Support to Maritime Operations) role. In the last few years it participated in all the main national and international exercises like “Central Enterprise” and “Clean Hunter” in Germany, “Odax” in France, “Syrio” in Spain, “Dynamic Mix” in Southern Europe and above all “Maple Flag” in Cold Lake and “Bright Star” in Egypt. These operations put the Gruppo among the most well-trained of the AMI orbat thus allowing it to participate in the “Deliberate Forge” and “Deliberate Guard” to enforce United Nation resolutions in Bosnia-Herzegovina . As for all the other Ghibli units the 13th Gruppo is equipped with AMX and one or two AMX-T. The 101st Gruppo is the unit responsible for the training of the pilots arriving from flight schools (61st Stormo at Lecce, equipped with MB-339A and CD, or NATO school at Sheppard, Texas, equipped with T-37 and T-38) and destined for the AMX. It is equipped with 18 AMX-T along with 5-6 single seats that let the Gruppo to retain its strike capabilities. An average of 12-15 pilots attends the OCU courses. Student pilots spend 8 months in Amendola flying 60 missions until attainment of the Limited Combat Readiness. The training includes low level flying, simulated strikes, formation and solo flights, air to air refueling, use of armament and air to air combat. This last phase is divided into: BFM (Basic Flight Maneuvers), ACM (Advanced Combat Maneuvers) and ACT (Advanced Combat Training) with sorties characterized by increasing difficulties. First missions involve just a couple of aircraft (1 vs 1), then the environment worsens with more aircraft (2 vs 2), Ground Controlled Interception and escape maneuvers. At the end of this phase student pilots leave the OCU and reach their new assignments: 13th, 14th, 103rd, 132nd Gruppi. They could return to Amendola as instructors only after wearing the desired 1000 flight hours patch and attending special courses (called MEDID) at Lecce and Guidonia. One year ago Amendola was in war. Local defences were in B alarm status, the Spada SAM batteries were alerted and ready to launch their Aspide missiles against every enemy intruder, the old F-104ASA-M from 3 Stormi (Wings) were always “ready in five” and the AMX were taking off with LGB hanging on their pylons, in bound to the targets in Serbia and Kosovo. In order to better understand what the Serbian conflict was like from an AMX pilot’s perspective, we met the current 13th Gruppo Commander, Lt.Col. Gustavo Cicconardi, a war veteran that was the Chief of the Operations Office of the base during the Allied Force. “When war broke up we were ready to play” Cicconardi told us “as we always train like we are in real operations, however what is really different, is the great amount of stuff you have to manage and organise between flights”. As Chief of base’s Operation Office Cicconardi not only had to fly with his AMX to Serbia, but also had to face a lot of logistical troubles. Amendola was daily hosting an increasing amount of aircraft and personnel coming from bases of the North that were making room for others arriving from their homebases. As soon as new aircraft arrived in Amendola there was the need to recover people, aircraft and bombs somewhere. “For many years, until the first bombing unit was based here in 1994, Amendola was only the base of the advanced jet school of the Italian Air Force and didn’t host operative units. This meant that neither tactical or strategic weapons were present in the base nor was there a particular need to build HAS (Hardened Shelters) for the recovery of the aircraft. This situation hadn’t changed when the 32nd Stormo moved here from Brindisi, but became critical when live ordnance was to be available for the Italian and foreign aircraft based here”. 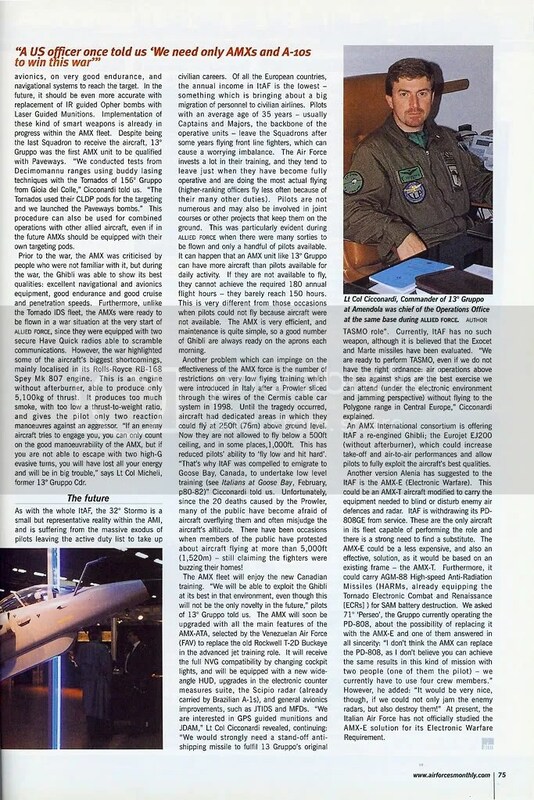 In fact, from a few weeks before March 24th 1999, Amendola was very busy hosting the DATF (Deployable Air Task Force) Detachment with F-16s from both Belgian and Dutch Air Forces and Starfighters from 9th and 10th Gruppi (Squadrons). “Many of the today’s changes in the airbase are a consequence of the war: we were compelled to build storage depots and protected ramparts for the bombs, arming and de-arming areas and a field deposit in a very short time and with a war in progress. The F-16s presence also compelled us to build a special safety area for the F-16s that carry hydrazine (to feed the hydraulic and electrical system of the aircraft when the engine flames out) next to the runway 29 threshold”. Only two “soft hangars” were available for weather protection, the rest of the aircraft had to be grouped in the “Alpha” apron next to the taxyways. Standing only slightly apart was the Starfighter cell that had to take off in Scramble and so had some containers to host the alert crew very close to the F-104s parking apron”. During a specific moment of the Allied Force, all the AMX belonging to the 2nd, 3rd and 51st Stormi moved to Amendola. The possibility of a massive attack against an airbase that could destroy all the aircraft had almost fallen to zero and Amendola was closer to the theater of operations. “Amendola was only 1 hour from the target and we could perform cycles of more sorties per aircraft”. Pilots benefited from the new base for two reasons: smaller ferry flights were less exhausting for crews that were subject to hard duties and, above all, while around the Northern bases (with American presence) pacifists protested against Italian and NATO’s intervention in Serbia, Amendola involvement hadn’t been “advertised” much by mass media and this let them work without further pressure. “The Operation Ghibli was composed of 19 aircraft, 10 of which had to be ready for flying. They all belonged to the most advanced 3rd Batch version; a reaction force composed of all Ghibli-equipped squadrons 13th, 14th, 103rd and 132nd while 101st OCU provided only pilots since its AMX-Ts couldn’t be sent to combat: despite being very similar to the single seats and retaining the same avionics, they are less manoeuvrable and have shorter endurance”. Ghiblis performed two average sorties per day. Lt.Col. Cicconardi recalled: “We only flew daylight missions as the cockpit lights are not NVG (Night Vision Goggles) compatible. We used both guided (IR “Opher”), unguided munitions (Mk 82) and we received some GBUs (GBU-16s) towards the end of the campaign and had very strict ROE (Rules Of Engagement) so we didn’t release our bombs unless we had all visual confirmations that the target could be hit without collateral damages”. Often aircraft came back from enemy territories with bombs unreleased, especially as a result of seasonal weather conditions in the target areas. On one occasion, an AMX was compelled to jettison his armament in one of the planned dropping areas of the Adriatic: “the pilot had pressed the FIRE trigger but the bombs hadn’t moved from the pylons so although they were still hanging underneath the wings, he was compelled to jettison them before coming to landing”. There was a lack of tankers in the Adriatic so no more than a single plug-in with the refuelers could be made, this sensibly influenced the campaign as aircraft waiting the allocation of a target from an A-FAC were sometimes compelled to head out of the area and return to the base without releasing their armament since they couldn’t refuel again. This occasionally occurred to the Italian AMXs: “we were allocated a “window” in which we had to provide on-call CAS (Close Air Support). If the A-10s didn’t find a target for us during our orbiting time, we headed back”. Pilots told us they were frequently illuminated by SA-2 Guideline, SA-3 Goa and SA-6 Gainful Surface to Air Missiles during their medium altitude missions but they didn’t unveil how many times missiles were actually sent against them. The AMX proved itself to be a good means to win the war as Capt. La Montagna told us: “it was so deeply appreciated by the war planners that a US officer once told us -We only need AMXs and A-10s to win this war- because he had realized the aircraft was efficient, accurate and reliable”. The Ghibli could rely on its excellent avionics, very good endurance and navigational systems to reach the target. In the future, it would be even more accurate with replacement of IR guided Opher bombs with Laser Guided Munitions. In fact, implementation of this kind of smart weapons is already in progress within the AMX fleet. Despite being the last Squadron to receive the aircraft, the 13th Gruppo was the first AMX unit to be qualified with Paveways. “We conducted tests from Decimomannu ranges using buddy lasing techniques with the Tornados of the 156th Gruppo from Gioia del Colle” Cicconardi told us. “The Tornados used their CLDP pods for the targeting and we launched the Paveways bombs”. This procedure can also be used for combined operations with other allied aircraft even if in the future AMXs should be equipped with their own targeting pod. “The AMX’ success is to be credited for the fact that the aircraft operated in the CAS mission, the one it was projected to fulfil. The aircraft was criticised from people who didn’t know it but during the war the Ghibli was able to show its disparaging best qualities: excellent navigational and avionics equipment, good endurance and good cruise and penetration speeds. It is also quite comfortable”. Furthermore, unlike the Tornado IDS fleet, the AMXs were already ready to be flown in war when Allied Force began, since they were equipped with two secure Have Quick radios able to scramble communications. However the war highlighted some of the most important shortcomings of the aircraft that can be mainly localised in its Rolls-Royce RB-168 Spey Mk.807 engine. It is an engine without afterburner, able to distribute only 5.100 Kg of thrust. It produces too much smoke, too low of a thrust to weight ratio. It gives the pilot only two reaction manoeuvres against an aggressor “if an enemy aircraft tries to engage you, you can only count on the good manoeuvrability of the AMX, but if you are not able to escape with two high-G evasive turns you will have lost all your energy and will be in big trouble” Lt.Col. Micheli, former 13th Gr Cdr) told us. As for the whole ItAF, the 32nd Stormo, that is a small but representative reality within the AMI, is suffering for the massive exodus of pilots leaving the active duty to join civilian careers. Among the European countries, ItAF personnel’s annual income are the lowest. This is causing a big migration towards civilian arlines. Pilots, usually Captains and Majors, the backbone of the operative units with an average 35 years, after spending some years flying the front line fighters, leave the Squadrons and this may cause some troubling unbalances. The Air Force invest a lot on them and when they are fully operative and are ones that fly more (as higher officers have a lot of other work to manage and can’t fly much). Pilots are only a few and maybe contemporaneously involved in joint Courses or other projects that keep them away from the stick of their aircraft. This was particularly evident during Allied Force when there were a lot of sorties to be flown and a handful of pilots available. “Sometimes it may happen that an AMX unit like the 13th Gruppo has more aircraft than pilots available for daily activity. If they are away they can’t achieve the 180 annual flight hours, they barely reach 150 hrs”. This is very different from the times when pilots couldn’t fly because their aircraft were not available; the AMX is very efficient and maintenance is quite simple so a good amount of Ghibli is ready each morning in the aprons. Another trouble that slightly affects the effectiveness of the AMX force is the number of restrictions to very low flying training activity that were created in Italy after the Prowler sliced the wires of the Cermis cableway in 1998. Until the mishap, aircraft had dedicated areas where they could fly at 250ft AGL. Now they can’t descent below a 500ft floor (somewhere 1,000ft) and this has somehow reduced the pilots’ ability to “fly low and hit hard”. “That’s why ItAF was compelled to emigrate to Goose Bay, Canada, to undertake low level training” Cicconardi told us. 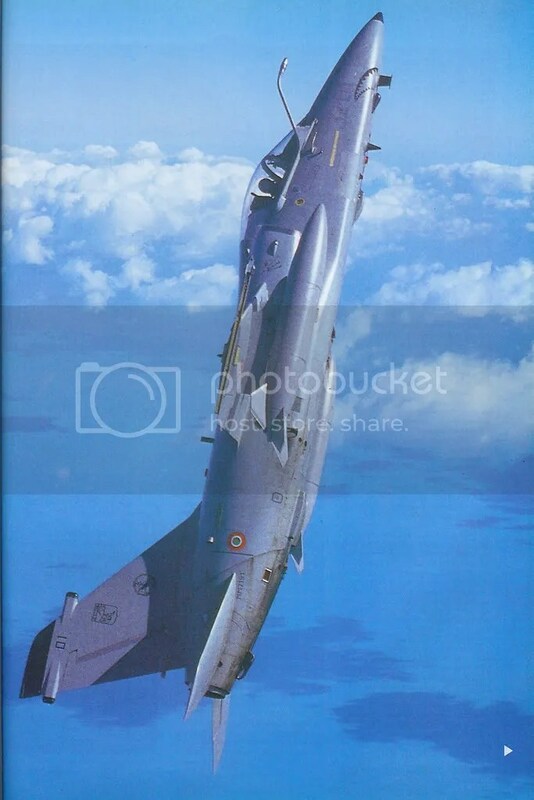 Unfortunately since the Prowler caused those 20 casualties people fears aircraft overflying them and often misjudge the actual altitude of the aircraft. In has been proved that on some occasions people protested for aircraft overflying at more than 5,000ft while they claimed the fighters were buzzing their houses! AMX fleet will enjoy of the new Canadian training. “We will be able to exploit the Ghibli at its best in that environment even though this won’t be the only novelty in the future” pilots of the 13th Gruppo told us. The AMX will be soon upgraded with all main features of the AMX-ATA, selected by the Venezuelan Air Force (FAV) to replace the old Rockwell T-2A Buckeye in the advanced jet training role. It will receive the full NVG compatibility by changing cockpit lights, it will be equipped with a new wide-angle HUD, upgrades in the electronic counter measures suite, the Scipio radar (already carried by Brazilian A-1s), and general avionics improvements like JTIDS and MFDs. “We are interested in GPS guided munitions and JDAM” Lt.Col. Cicconardi unveiled, continuing: “we would strongly need a stand-off anti-shipping missile to fulfil 13th Gruppo original TASMO role”. Currently ItAF hasn’t such a weapons although someone said Exocet and Marte missiles were evaluated. “We are ready to perform TASMO, even if we haven’t the right ordnance: air operations above sea against ships are the best exercise we can attend (under the electronic environment and jamming perspective) without flying to the Polygone range to Central Europe” Cicconardi explained. AMX International consortium is offering ItAF, a re-engined Ghibli; the Eurojet EJ200 (without afterburner) could increase take-off and air-to-air performances and could allow pilots to fully exploit AMX good qualities. Another version proposed by Alenia to the ItAF is the AMX-E (Electronic Warfare). This could be an AMX-T aircraft modified to carry all equipment needed to blind or disturb enemy air defences and radars. ItAF is about to withdrawn its PD-808GE from use. These are the only aircraft within its fleet to perform the role and there will be shortly a strong need to substitute this assets. The AMX-E could be one of the less expensive and at same time effective solution: it would be based on an existing frame, the AMX-T, and furthermore AMX-E could carry AGM-88 Harm (already equipping the Tornado ECRs) for SAM battery destruction. We asked the Gruppo currently operating the PD-808, the 71st “Perseo” about the possibility to replace it with the AMX-E and one of them sincerely answered us: “I don’t think the AMX can replace the PD-808 as I don’t believe you can achieve the same results in such a particular mission with two people (one of which piloting) while we currently have to use 4 crew members”. However he added: “it would be very nice though if we could not only jam but also destroy the enemy radars!”. At present, Italian AF hasn’t officially studied the AMX-E solution for its EW matters.